Survey: Can Code Capture Job Candidates' Capabilities? | Challenger, Gray & Christmas, Inc. In the survey conducted among 300 human resources executives by global outplacement and executive coaching firm Challenger, Gray & Christmas, Inc., 40 percent said they are already using software to aid in their hiring determinations. And, those not using the software apparently would like to, as 80 percent of all respondents said it is a useful tool and should continue to be a part of the hiring process. “Many metropolitan areas around the country are already seeing unemployment rates well below 5.0 percent, at which point, it becomes more difficult to find great workers. But a talent shortage doesn’t mean that employers will simply hire any warm body. Human resources professionals know all too well that hiring mistakes are costly,” said John A. Challenger, chief executive officer of Challenger, Gray & Christmas, Inc.
“To avoid hiring missteps, more and more companies are turning to assessment software, which has become increasingly sophisticated at revealing things about candidates that could be easily overlooked in a screening and interview process that relies solely on humans,” said Challenger. 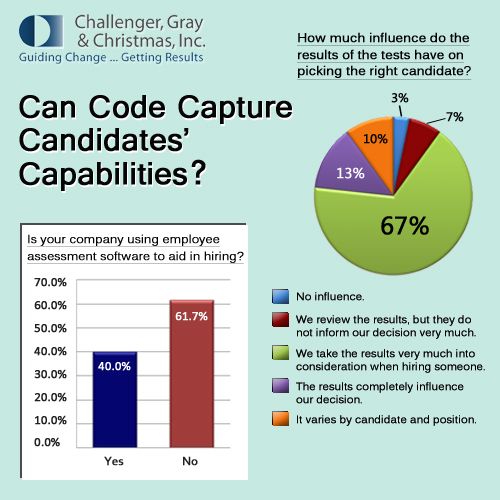 The Challenger survey found that 39 percent of companies using assessment software, use it to determine if a candidate is a good fit for the company overall. Meanwhile, another 35 percent use it to decide if a job seeker is a good fit for a specific role. What might be surprising to some outside of the HR community is that only 10 percent use the assessment software to determine if the candidate is capable to perform certain functions. “This is not to say that skills are not important. But being a ‘good fit’ -- whether we are talking about overall culture, management style or simply personality -- is even more important. A new worker can be trained to perform specific functions. It is much more difficult, if not impossible, to remold a person to be a better fit for the company,” said Challenger. 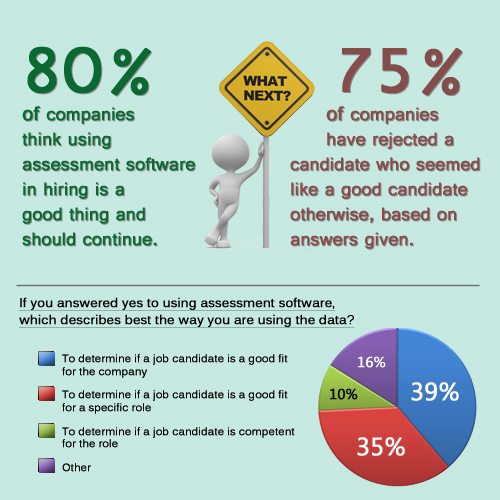 The vast majority of respondents using assessment software seriously consider the results, with 67 percent saying they take the results “very much into consideration” when hiring a candidate. Another 13 percent said the results completely influence their decisions. Furthermore, 75 percent of hiring managers who utilize hiring software have rejected a candidate who otherwise seemed like a good fit for the role and company. While a high percentage of respondents liked the idea of using software, there were about 20 percent who remained wary of using assessment software in hiring decisions. “An over-reliance on this software could lead to ineffective interview tactics down the line, and depending on the design and accuracy of the software, it may eliminate candidates who are actually a perfect fit for the role. In one instance described by a survey respondent, a candidate who had more than the requisite education was overlooked because the software didn’t ask for the specific certification,” offered Challenger. “One-on-one interaction in the interview process should never be abandoned, as it remains an effective way to assess whether a candidate is a good fit for the company. However, we humans are not perfect and our preconceptions, prejudices, and experiences can dramatically shape the way we judge others. “Online assessments don’t have preconceptions or prejudices. And, they can be quite effective and catching things a human interviewer might easily overlook. These missed attributes will eventually come to light, but usually not until the company has already invested significant resources on hiring and training the individual,” said Challenger. “There are risks of becoming over-reliant on technology, but, at the end of the day, any tool that helps give a clearer picture of a job candidate is a boon to hiring managers. Even at the most basic level of software, which simply identifies key words in electronically-submitted resumes, the time-saving factor is a significant benefit. The typical job ad elicits an average of 40 applicants -- a number that undoubtedly soars into the hundreds for large companies and certain industries. It would be impossible to sift through that many resumes without some sort of automated help.